Several hundred people gathered at parks and took it to the streets of Tokyo on Oct. 15, the day of global action to Occupy Together. 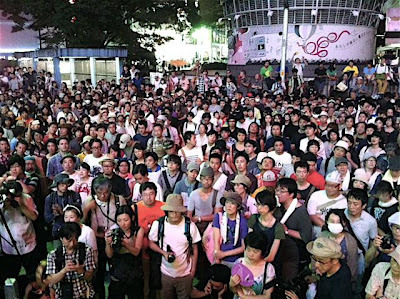 One of the Tokyo actions had more than 100 independent, trade unionists and activists at a small park in Roppongi, a trendy district of Tokyo. 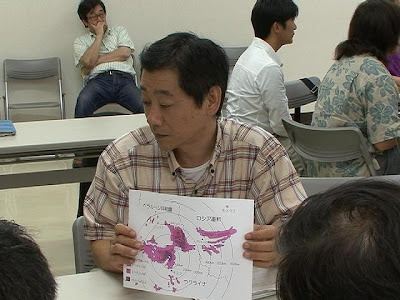 Each spoke of their demands to the government, income disparity that continues to be worse and concerns over radiation contamination by Fukushima Daiichi nuclear power plant. 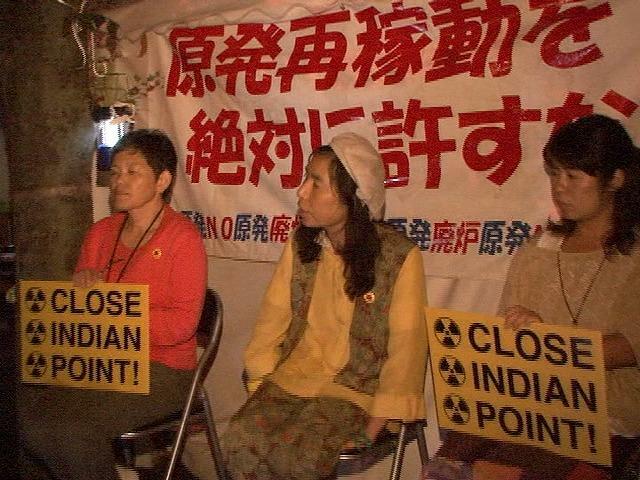 The Roppongi action received a solidarity message from Occupy Seoul and talked to the members of Occupy in Merced, California, and Washington D.C. via Skype. Although police and secret agents surrounded the rally, the 99% were strong and persistent with music and free vegitable curry served. Occupy Tokyo organizers plan to have another action sometime soon. 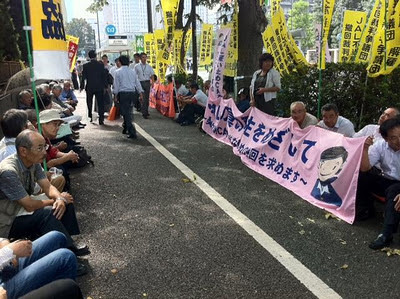 The plaintiffs and their supporters, demanding Japan Airlines to reinstate 165 employees who were dismissed in December last year, gathered in front of the Tokyo District Court in the morning on 30 September. 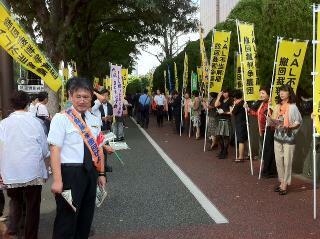 Some of them were in the uniform of JAL pilots, others holding banners expressing their demands. The day marked the highlight of the trial with the court appearance of the Chairman, Kazuo Inamori who admitted, in a press conference in February, that the dismissal was unnecessary in light of the restructuring plan of the company. He however disappointed the courtroom audience by mentioning his earlier remark as "imprudent and regrettable." Satoshi Tokairin, one of the audience, described Chairman's testimony as "outrageous." "Inamori pretended to be a token representative of the JAL management with no actual role in the unlawful dismissal. He said he was unaware of the fact that the restructuring target had already been achieved by that time and put all the responsibilities on the receiver, " he said. In the inquiry of the day, the leader of the plaintiffs, Taeko Uchida, examined Inamori herself, but he replied to all her questions with phrases indicating lack of knowledge, involvement or memory. The audience was so appalled to the extent that they could not help laughing at times. Members of the Postal Workers’Union conducted a sit-in protest in front of the head office of Japan Post on 27 and 28 September. The protest was against the dismissal of 14000 non-regular workers aged over 65 scheduled for the end of the month. "It is absolutely unacceptable that the company unilaterally made it possible for them to dismiss non-regular workers of certain ages simply by manipulating the employment regulations. Like myself, people of these ages are often playing leading roles among the employees of the sections they belong to. 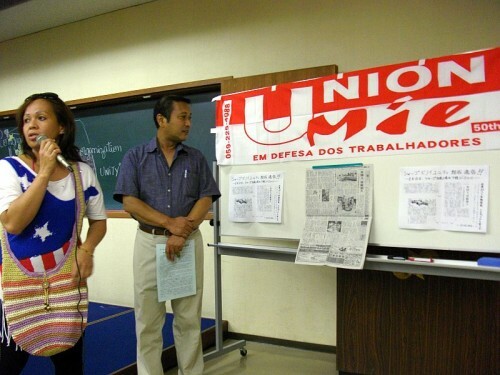 The present decision has taken no consideration of such circumstances in our work places," said outraged Tadanori Fukao (left in the photo), a telephone operator at a call-center. 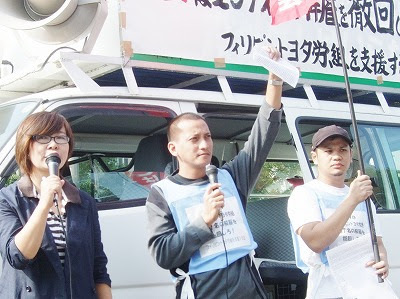 Ryoko Niwa (right in the photo), a delivery driver, criticized JP harshly. "Four colleagues are to be dismissed in my section and it will be impossible for the remaining staff to process the same amount of workload. On the other hand, the same jobs are offered in the employment service office. This is ridiculous! The massive dismissal will disrupt the work at post offices and inevitably result in worsened service." Among 14000 workers to be dismissed, 32 belong to the Postal Workers’Union. The reporter was informed that they were considering a lawsuit. 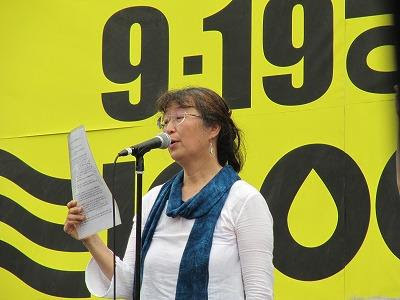 Sachiko Sato of the Fukushima Network for Saving Children from Radiation and five other anti-nuclear activists held a press conference in front of the Ministry of Economy, Trade and Industry on 25 September to report on their visit to the United States. A national rally titled 'We say No! 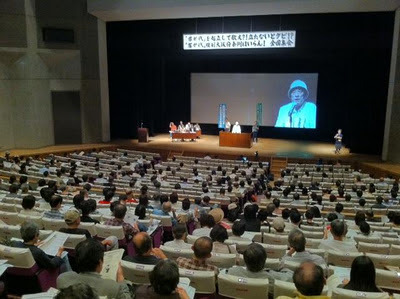 to the ordinance of Kimigayo coersion' was held in Osaka on 24 September with participation of some 800 citizens local as well as from other prefectures. 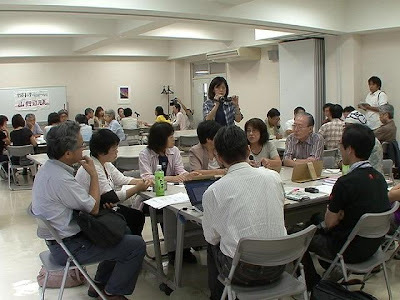 The participants,including many teachers and students, were driven by mounting concerns surrounding the prefectural government's aggressive move toward enactment of education-related ordinances that reflect nationalistic view of the right-wing governor, Toru Hashimoto. In the opening speech of the rally, Philosopher Tetsuya Takahashi severely criticized the proposed ordinance and Hashimoto himself. "It should be called 'The Basic Ordinance for Destruction of Education.'" "The governor's vision of Osaka government is that of the imperial system whereby the governor is the emperor." Following Takahashi's speech, teachers struggling under similar situations in other prefectures made short speeches of solidarity. 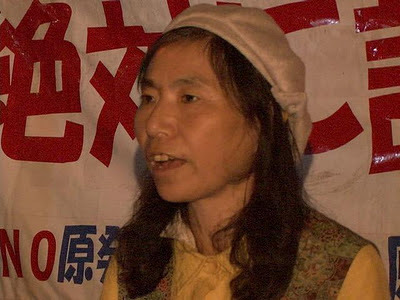 Among them was Kimiko Nezu, an ex-teacher from Tokyo who continued defiance of Kimigayo through to the retirement of this year despite three times of six-month suspension. She encouraged fellow teachers to keep to their belief and not to give in. Masaki Yumoto, a university student one of whose parents is non-Japanese national, raised an issue for the protest movement while commenting critically on the proposed ordinance. "It would coerce children of non-Japanese nationalities to give away with their own identities. This is why I feel against it. I also feel that the protest movement has yet to involve younger generations. I urge the participants to consider what each of you can do to reach out to the youth." The rally was webcast by Labornet TV. 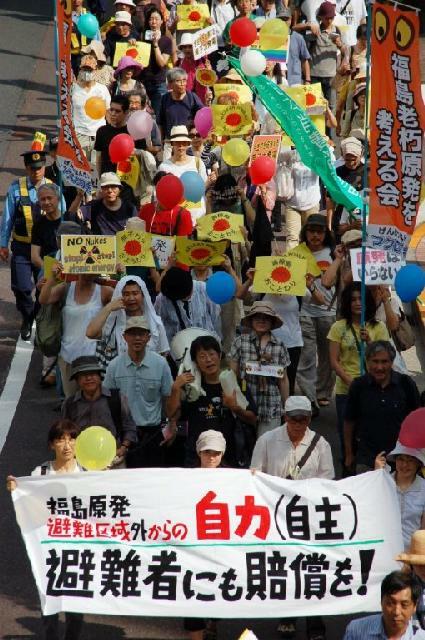 On 19 September, Meiji Park in Tokyo was filled with people and their calls for abolishment of nuclear power plants. Organized workers and other citizens belonging to all sorts of groups as well as individuals not affiliated with any particular organizations gathered together, expressing their desires for nuclear-free world on banners and sign boards. "Fukushima is still much contaminated with radiation. The status is far from 'under controll.' We will by no means allow other nuclear plants to resume operation. There is noting more valuable than the life!" Core promoters cried out angrily and the crowd responded with enthusiastic applaud. The rally was followed by a demonstration march in three routes. Though the march lasted for for more than four hours, the participants were cheerful. They seemed to be delighted, empowered by the fact that as many as sixty thousand people came together. We, Suppor Group for TMPCWA in Japan,, launched from last October 9 thru 12 a series of concerted concurrent joint action with TMPCWA against Toyota, both in Japan and the Philippines, seeking for the solution of a 11-year longstanding struggle against a mass dismissal. Inviting two union members representing TMPCWA (Union Vice President Wenny and Union Member Rowell) to Japan, we, supporters from Kanto Area went over by bus to the place in front of Midland Square by Nagoya Station of JR (Japan Railway), namely in front of toyota Aichi Headquarters to make, together with the local supporters in Aichi Area, PR activities to citizens of Nagoya City, and after that held a solidarity exchange meeting at Toyoda City Industrail and cultural Xenter. 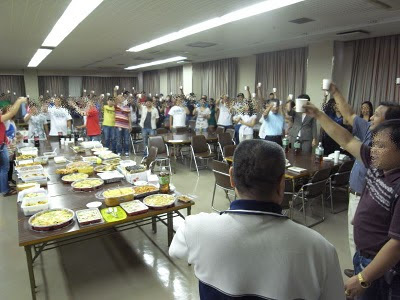 The next day, from early morning, around Toyota Headquarters and Plant, we circulated to Toyota workers showing up for their daily job a paper napkin packet combined with a bill appealing their support and also made a request to the Headquarters. As a quite remarkable fact indeed, we had astrong impression that the workers coming their way to the company all looked so tired and somber as if they had had no human feelings. 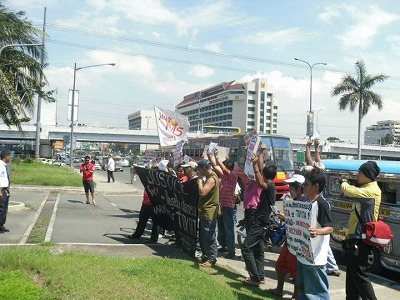 On the other hand, in the main site, the Philippines, on October 10, bothe the dismissed members and the inside members currently working at Toyota plant of TMPCWA, together with a number of their supporters and member workers from other unions who came to join for cooperation, conducted a series of protest actions before Department of Labor and employment (DOLE), Department of Justice (DOJ), Japanese Embassy, etc. The joint actions both in Japan the Philippines were sucessfully finished thanks to the solidarity of workers. 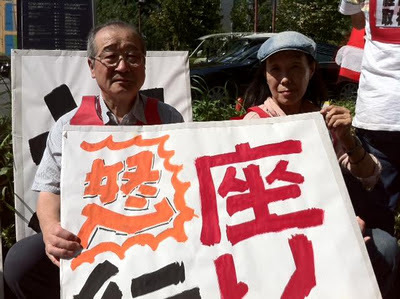 National Union of General Workers, Tokyo Tobu, won a lawsuit against Hankyu Travel Support Co. for failing to pay overtime work. 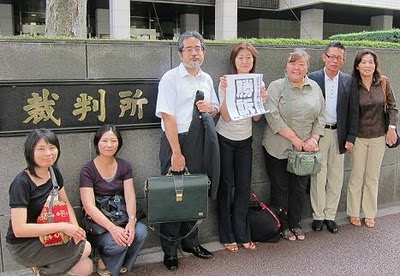 The Tokyo High Court upheld lower court’s decision on Sept. 14 that the company must calculate work hours of tour guides. The court dismissed the company’s claim that the overtime hours were included in the salary because it was difficult to calculate the hours. The court ordered the defendant to pay 513,730 yen unpaid and an equivalent amount for penalty. ラベル: human chain, Kojin Karatani, Nuclear Power Plants, Tokyo Electric Power Co.
JR Needs to Recover All Railroads in Tohoku Now! 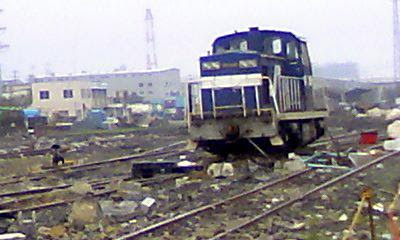 Some railways damaged by the Great East Japan Earthquake were repaired and the services resumed. Reports say that the worst is over since the recovery of Tohoku Shinkansen and Tohoku Line. However, some along the Pacific coast, including JR Hachinohe, Yamada, Ofunato, Kesennuma, Ishinomaki, Joban and Sanriku Tetsudo Railways, have no prospect of repair or recovery. “It may be a waste to repair the track because we don’t know how the towns are going to be reconstructed,” Japan Railway East officials said. True. But while other transport systems, such as roads and docks, are recovering by the day, railroad services that are basic infrastructure are left untouched. The railways that run through Tohoku like veins were said to be costly, a losing business, and facing a change in ownership to avoid complete closure. The central government and Japan Railways imposed heavy burden on passengers and local governments. And they are hoping to completely shut down these train services, taking advantage of the disaster. (By Katsuji Yamahara) *Photo: Sendai Shinminato Station left unrepaired. 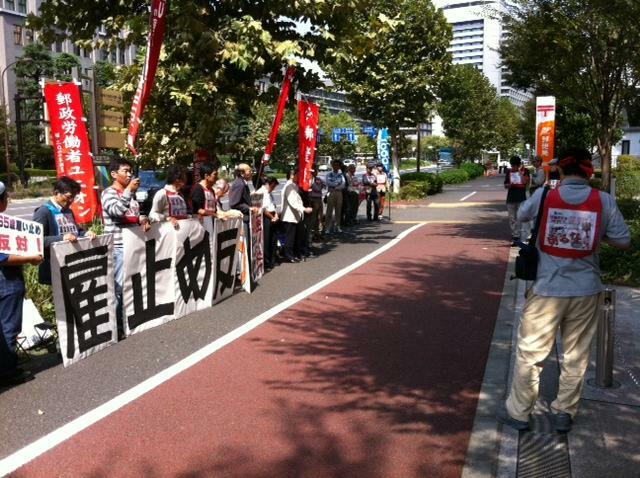 Nearly 200 workers established a union at Sharp Co.-affiliated plant in Matsuzaka City, Mie Prefecture, on Aug. 18. The members manufacture liquid plasma display at Sharp Mie Plant No. 2 and No. 3 in the city. They are all Filipino working at GL, which is an outsourcing company of Mie Tech, a Sharp subsidiary. There are about 300 people working at the plant, but the union, Union Mie Sharp PNoy Unity, was able to organize more than a majority of workers. PNoy means Filipino, and the union was established as a branch of Union Mie. (By Esaman) See video on UnionTube. *Photo: Celebrating PNoy Unity establishment on Aug. 20.